Quality. Innovation. Convenience. Designer Face Frames make it easy for cabinetmakers to offer classy, designer-inspired looks without the hassle of making their own face frames. 16 Unique Frame Edge Options. 3/4” or 7/8” Frame Thickness. Quality. Innovation. Convenience. Designer Face Frames make it easy for you to offer classy, designer-inspired looks without the hassle of making your own face frames. Improve your work flow and simplify your shop process by combining your order for Designer Face Frames with doors, molding, accessories, and sheet goods all finished with our Water-Based Finishes line of quality finishes. Designer Face Frames offer the extensive options you need to customize your work with 13 unique designs: beaded, inset molding, and square frame options. Plus additional options of curved frames are available as part of our Radius Face Frame offering. You can choose either 3/4” thick frames (395) or 7/8” thick frames (396). All beads and moldings are stepped down from the frame. Our offering of beaded and beveled face frames allow you to offer traditional beaded frames and also customized square and half bead options. Unlike anything else in the market, these stylish face frames dress up any setting. Our Designer Face Frame can be ordered as part of our 12”, 18”, and 24” Standard Radius Program in convex or concave shapes. Currently, non-standard radius shapes are not available in face frames. Radius Face Frames are not available in all species. * Configuration 207 - From simple to complex, provide us the drawings and measurements of the configuration you need if it is not one of the nine options above. Custom configurations may be subject to additional option charges. Face frames are available in 3/4” and 7/8” thickness. Face Frames are available in most wood species offered by Decore-ative Specialties except Medium Density Fiberboard (MDF). There are material limitations for Inset Molding Frame (FE-2) which are listed in our pricing guide. Check for availability when ordering. The material grade requested is for the face of the face frame. The back will be a lower grade than the face. Face frames are offered with Water-Based Finishes for your convenience. The back side of face frames will not be finished. If you required finished backs please indicate that on your quote and order. Please specify the desired Finish Grade material when placing your order. Face frames are drilled and assembled with pocket screws and glue. Face frames can also be ordered ready-to-assemble (RTA) so all you have to do is assemble, sand, and finish. Stile and Rail width minimums are determined by the Frame Profile you are selecting. FE-1, FE-4, FE-6, and FE-8 Frame Edges have a preferred miniumum of 1-1/2". FE-2, FE-3, FE-5, FE-7, FE-9, FE-10, FE-11, and FE-12 Frame Edges have a preferred minimum of 1-3/4". If one dimension is greater than 48" the other dimension must be less than or equal to 48". Maximum size for FedEx shipments is smaller than listed maximum size. Due to machinery considerations we cannot manufacture under the minimum size. Opening sizes can be manufactured under Minimum and will include a special option fee. Face Frames are manufactured to the nearest 1/16”. 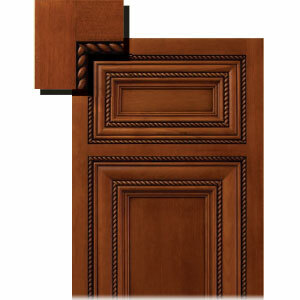 You can specify Dado placement for the Top, Bottom, Left, Right, two on Left, and/or two on Right. Placement is determined by looking at the front of the frame. For top & bottom frame widths 1-1/2” to 2-1/2” only one pocket screw will be used. Specify on the order form which lines require dados and their placement on the frame. For the right side and left side, mark inside and/or outside on the order form.